Synopsis: Almost 30 years after the Muppet Babies first won the hearts of kids and families around the world, Disney Junior’s reimagined “Muppet Babies” chronicles the hilarious playroom antics of a young Kermit the Frog, Piggy, Fozzie Bear, Gonzo and Animal – plus a brand-new Muppet Baby, Summer Penguin. Under the watchful eye of Miss Nanny, the Muppet Babies use their imaginations to embark on countless adventures that take them to the farthest corners of the universe and demonstrate to young viewers the power and potential of imaginative play. 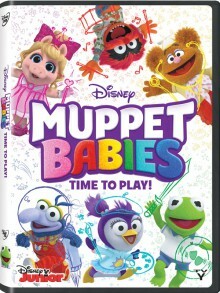 To enter for a chance to win a DVD copy of MUPPET BABIES: TIME TO PLAY, send an email to contest@LatinoScoop.com. When entering, please submit your full name, email address and phone number. LatinoScoop will select a few winners. Winners will be notified via email.